This soap-free, no-rinse cleanser will gently dissolve makeup, excess sebum, and dead skin to refresh and purify your complexion. Formulated with hyaluronic acid, HYAMATRIX® Face Cleansing and Makeup Removing Lotion improves your skin’s natural moisturizing factors to hydrate as it cleanses. After using Cleansing Lotion, your skin will feel replenished and clean. 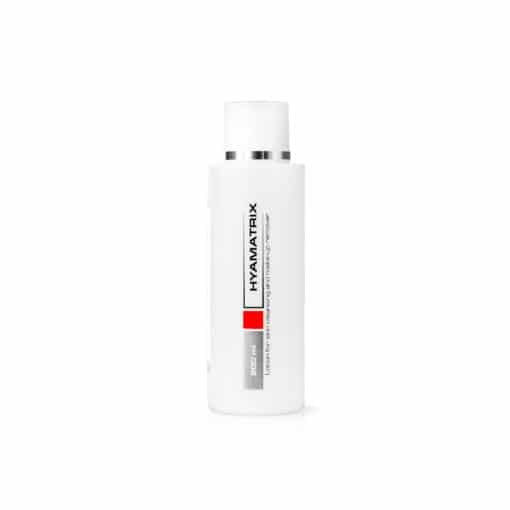 Repeated use of Cleansing Lotion also improves your skin at a cellular level. Papain enzyme gently removes “stuck” dead skin cells which dull the complexion. This amazing ingredient also stimulates your skin to reach its optimal keratinization process, so skin functions like it’s supposed to. The result? Your skin will look and feel more luminous, soft, and even-toned over time. 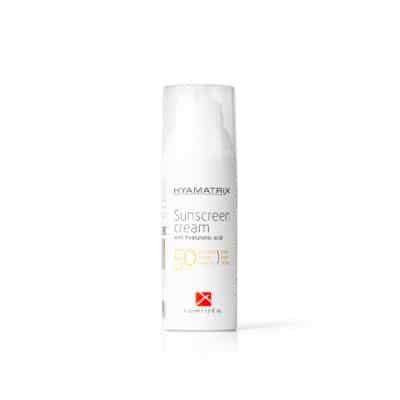 This non-irritating, alcohol-free lotion is appropriate for all skin types and preps skin for further treatments. Effortlessly dissolves stubborn makeup and excess sebum with a gentle alcohol-free formula. Hyaluronic acid replenishes your skin with hydration as it cleanses. Clears away dead skin cells from the surface of your skin to reveal a more glowing complexion underneath. By removing these dead skin cells, our Cleansing Lotion corrects abnormalities in your skin’s keratinization process. Visible skin disorders caused by abnormalities in the keratinization process include hyperpigmentation, a dulled complexion, and thickened skin. With regular use, Cleansing Lotion normalizes the epithelial process so your skin regenerates as it did when it was young. 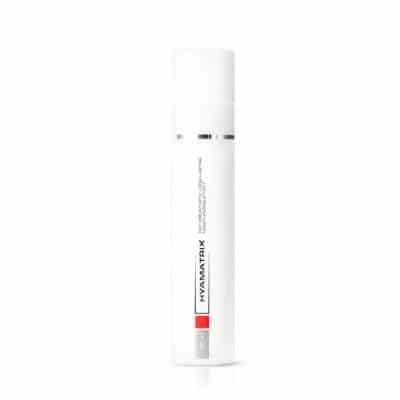 Low Molecular Weight Hyaluronic Acid – Replenishes skin with moisture while cleansing. Adds to your skin’s natural moisturizing factors to lock in healthy hydration. Papain Enzyme – Gently exfoliates dead skin cells, encouraging a renewal of the epidermis and preparing the skin for further treatment. Using papain enzyme on your skin daily will stimulate your skin to reach its optimal keratinization process, diminishing visible disorders like hyperpigmentation and a dulled complexion. 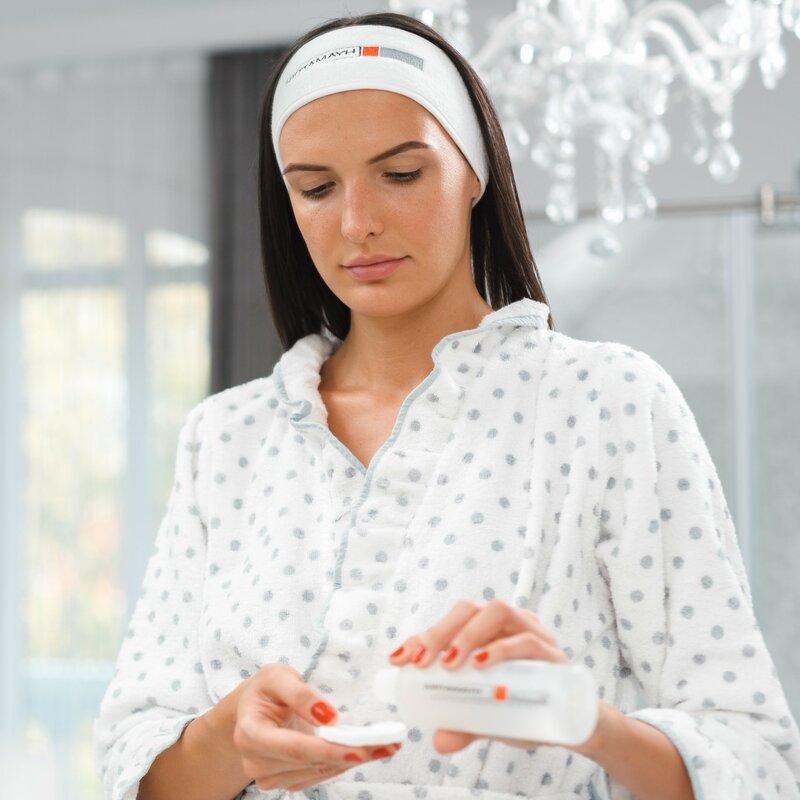 Saturate a cotton pad with the solution and sweep over the face, neck, and décolletage. Use in the morning and evening. Do not rinse. Follow with serums and creams. 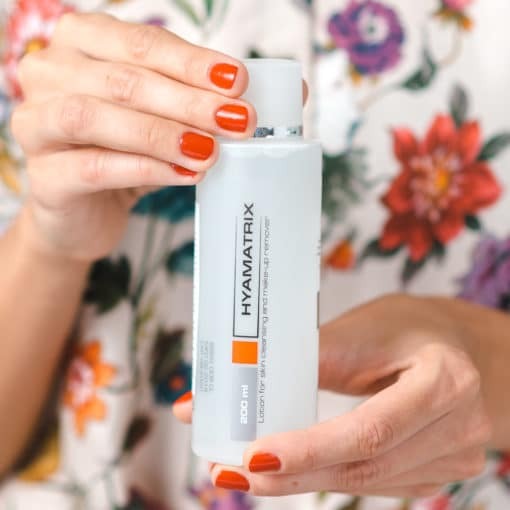 With gentle yet effective ingredients, HYAMATRIX® Face Cleansing and Makeup Removing Lotion is appropriate for all skin types, ages, and conditions.